Joan from Joan’s 5 Star Reviews has had the opportunity to try many Scentsy products and her love of Scentsy has led her to bringing you this fun giveaway. This whimsical Warmer is reminder of a sunny day at the beach, adorned with sand and seashells, and in the shape of a pail, this warmer is sure to be a hit in any home! Scentsy is an unique candle warmer system that is a decorative, clean, and safe alternative to the traditional candle. Scentsy uses a 25 watt light bulb to slowly melt the highly scented wax to just over body temperature in a dish. This maximizes the life and strength of the scent and eliminates a flame, soot, and fear of burns. Your house and children are completely safe and you have piece of mind knowing your children are safe from the harmful effects associated with traditional candles. 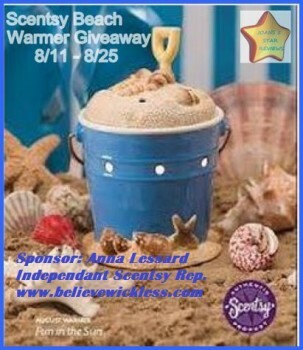 Who want’s to win their own Fun in the Sun Warmer and the new Fuzzy Blanket Scent melts from Scentsy? Entrants must be 18 or older and in continental U.S. Only. Winner will be chosen at random through giveaway tools and will be notified via email. Please add joanpenfold4@gmail.com to your safelist! Winner will have 48 hours to respond or another winner will be chosen.Giveaway will run from 8/10/14 – 8/25/14. Enter below to win your own Fun in the Sun Melter and New Fuzzy Blanket Melts. Good Luck to you! If you are a business wanting a review of a product/service please feel free to contact Joan’s 5 Star Reviews at joanpenfold4@gmail.com. I would be happy to discuss how I can help your business grow! I’d love a couple of the plugin warmers – I love the more subtle scent that plugins provide, and how they fill the room instead of sitting in one spot. Simply Irresistible Romance Collection Scent. I am interested in that. I already have the Warmer and my sister in law stopped selling The Scentsy. LOVE the new Clover the Cow buddy! SO cute!! Each of my 3 kids has one (Penny the Pig, Ellie the Elephant and Roarbert the Lion), but I think we need this one too! interested in the scentsy buddies and the washer whiffs! I would love the white tea and cactus and sunkissed citrus shower gel. I’m interested in the laundry detergent and washer whiffs! I would love to try the Scentsy shower gels. I like the scentsy buddie I like Rowan raccoon. I love all of the boots! If I won, I would love to get a pair for my daughter. Probably the Baby Flac Red ones! Thanks for the chance! I want to try the Layers products like the laundry detergent and softener as well as the bath tablets. I would love to try the sugar cookie shower gels. I had no idea they had shower gels! I’d love to try the Sugar Cookie or the Vanilla Suede scents! I am interested in the Scenty Buddies, especially Clover the Cow. I really like the Owlet Scentsy Warmer. I have about 3 other Scentsy Warmers and I can’t get enough. I love the Scentsy prouducts and the way they make the house smell so good.